iscrizioni entro il 31 agosto 2016 e premiazione il 9 ottobre a Roma presso il Conservatorio di Santa Cecilia via dei Greci 18 - esposizione degli strumenti premiati e ammessi ( violini, viola, violoncelli e contrabbassi ) sino al 22 ottobre. La consegna degli strumenti dovrà avvenire presso il Conservatorio S. Cecilia il 29 0 30 settempre o il 1/10/2016 nei seguenti orari: 9-13 e 15-18. Ogni strumento dovrà essere fornito di apposita liberatoria da qualsiasi responsabilità nei confronti del Conservatorio S. Cecilia. La cerimonia di premiazione si terrà presso la Sala Accademica del Conservatorio S. Cecilia domenica 9/ ottobre alle ore 17 prima del concerto conclusivo con gli strumenti vincitori. 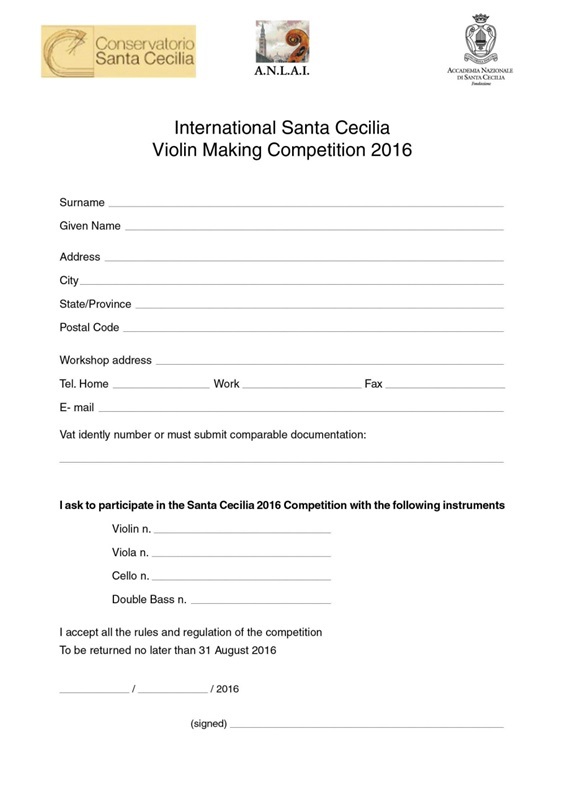 Santa Cecilia Conservatory in Rome and ANLAI are hosting the International Violin Making Competition "Santa Cecilia 2016" open to professional luthiers all over the world. Deadline for applications is August 31st. 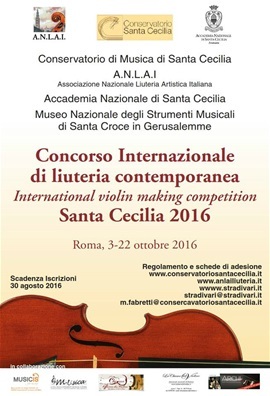 Prizes will be awarded in Rome on October 9th at the Conservatory - via dei Greci 18 with an exhibition of the participating and winning instruments (violins, violas, cellos and contrabasses) till October 22nd. The original or a photocopy of proof of payment of the registration fee (70 Euros per instrument) must be attached to the application. Applications must be signed, indicate an acceptance of the rules and regulations listed below. These categories will be further divided into two sections modern and one of which regards antiqued instruments. Once the jury's final decisions are made the instruments will be displayed to the public. The exposition will be held at the Conservatorio Santa Cecilia of Rome from the 10th to the 22nd of October 2016. For this entire period the instruments will not be withdrawn or substituted. The application implies acceptance of the regulations governing the competition. Proof of payment of the registration fee (70 Euros) must be attached to the application. Payment should be made through direct deposit to the Conservatory. 3) display abnormal measurements. To specify, the length of the body of the viola must not be less than 400mm nor greater than 420mm. The length of the vibrating string for contrabass should be between 104 and 110cm. 4) accompanied by a written opinion unanimously held by the jury instruments considered incompatible with the level of the competition. The installation of strings that the competitor feels are appropriate to the instrument is permitted. The contrabasses must have orchestra strings. The works presented to the competition must be absolutely anonymous. Every instrument and the case that contains it must be without signs or elements that could lead to recognition or identification of the author. Any labels, stamps, brands or monograms of any sort must not be presented on the visible surfaces of the instrument. Instruments that do not conform to these rules will be excluded from the competition. The instruments should be delivered to the Conservatorio S. Cecilia on 29 or 30 september or first of October 2016 at the following times: 9-13 and 15-18. Every instrument should be furnished with a release form releasing the Conservatorio S. Cecilia from any liability. Delivery should be by a person trusted by the author, which person will appear as the sender. Alternatively delivery can be by a delivery company hired to provide this service by October 1 2016. At the time of the delivery, in the presence of the co-signer, the condition of each instrument will be determined. For this purpose the receiving employees will issue a receipt in which the date and time of delivery will indicated, as well as the word "ORIGINAL". If the instrument is sent through a delivery agency, the package will be opened subsequently in the presence of three persons entrusted to this task by the Conservatorio S. Cecilia. The receipt discussed above must be retained and presented when the instrument is withdrawn. It is to be remembered that instruments coming from outside the E.U. must accompanied by an ATA booklet. Any deliverer chosen by the competitor must ensure the correct carrying out of the practices relative to both delivery and withdraw of the instrument. Expenses relating to deliver and withdraw are entirely the responsibility of the participant. 1 - The name, surname, date and place of birth, citizenship, and complete address of the author as well as the date and place of construction of the instrument. 2 - A brief curriculum vitae and two color photographs of the competitor. 3 - Two 3x10 cm color photographs reproducing the complete instrument seen from the top and the bottom. Envelope "B", that should remain open, must contain a set of replacement strings identical to those mounted on the instrument. 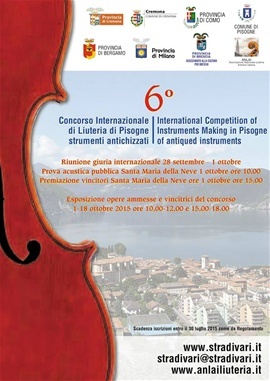 The jury for the 2016 competition is composed by the president, five master luthiers, and four musicians. The jury's decisions are final. Prior to the start of the work of the jury an opaque, sealed envelope will be provided to cover the tag with the brief identifying text. Every envelope will bear a progressive number that will constitute the order of selection. The first selection will have the aim of eliminate all non-regulation instruments. The jury will work in two separate groups. The instruments that do not reach the minimum number of points established by the jury in their artistic evaluation will not be subjected to an acoustic evaluation, but still may be displayed and published in the catalogue at the jury's discretion. The total points one will determine the rank order. Those instruments that the jury decides have reached the requisite number of points will participate in the final acoustic test open to the public where the instrument will be tested by a "solo". At this point the jury will thus have at its disposition further total points. The total number of points achieved by adding the final score to the previous scores will determine the winners of the competition and the second and third prizes. The special "Guglielmo dall'Ongaro" prize will be awarded to the competitor with the highest score under 30 years old. The list of the instruments admitted to the final competition will be published on the website of the Conservatorio Santa Cecilia through the texts that indicate the instruments themselves. The cards with the texts will in any case remained covered until the final result of the competition. At the end of the jury's work and the completion of the ranking, the envelopes containing the names of all the participating luthiers will be opened. The results of the competition will be publicized and distributed at the end of the selection. All the single and total scores will be published on the site of the Conservatorio Santa Cecilia. The envelopes belonging to instruments that are not admitted in the competition will be kept closed until the publication of the results of the competition. During the prize ceremony the jurors will be available to meet with the competitors should they so desire. The prize ceremony will be held at the Sala Accademica del Conservatorio S. Cecilia on Sunday, october 9 tenth 2016 at five o'clock in the afternoon before the concluding concert with the winning instruments. At end of the exposition the displayed instruments can be collected, together with the replacement strings and the remaining documentation in envelope "A", by those who present the ORIGINAL receipt of delivery. The instruments must be collected within 5 days from the date of closure of the exposition. In case of failure to collect the instrument with the term stipulated above, the instruments will be deposited at the accounting office of the conservatory. The insurance coverage is active from the moment of delivery of the instrument to the Conservatorio S. Cecilia until its collection or to the time that the uncollected instruments are deposited at the accounting office, as per article 9. For all controversies deriving from the interpretation or application of the present regulation the only competent jurisdiction will be that of Rome. Il suono del violino che fa riscoprire l’ex refettorio della Chiesa di San Pietro al Po, spazio dimenticato da molti cremonesi, parte dell’antico monastero benedettino in via Cesari. L’apertura straordinaria in occasione dei Concorsi di Liuteria di Pisogne, organizzati dall’ANLAI, che hanno visto la partecipazione di circa 200 liutai provenienti da 22 paesi diversi. Accanto ai preziosi strumenti, le 226 figure dipinte da Gatti nella splendida ‘Moltiplicazione dei pani’. Lì, nella mattinata, la prova acustica con l’esibizione di violini, viole e violoncelli finalisti. Alle ore 18 un concerto con gli strumenti in gara sia del m° Cristiano Rossi, sia degli altri tre musicisti membri della Giuria il violinista di Venezia Sebastiano Maria Vianello, il violista napoletano Marco Traverso ed il violoncellista siciliano, ma che opera a Torino, Ninni Saladino che si esibiranno in un inedito trio. La Giuria del 3° Concorso internazionale di liuteria di Pisogne per strumenti antichizzati e copie di strumenti antichi presieduta dal m° liutaio Florian Leonhard (presidente onorario il m° Cristiano Rossi) , ha concluso i suoi lavori. E’ stato portato a termine anche l’esame di tutte le opere presentate al 6° Concorso nazionale di Liuteria. La Giuria, molto selettiva e rigorosa ha esaminato circa 200 opere provenienti da 22 paesi rammaricandosi del fatto che molti strumenti provenienti dalla Cina non siano giunti in tempo a causa delle decisioni doganali. La valutazione unanime delle opere ammesse è stata positiva ed il presidente ha voluto esprimere un giudizio di grande compiacimento per la serietà, la competenza e la correttezza di tutti i membri che hanno lavorato in estrema collaborazione. Ha sottolineato anche il fatto che tutte le decisioni sono state prese all’unanimità. La scuola milanese esce indubbiamente vincitrice del concorso nel settore delle opere a pizzico e plettro. Affermazione incondizionata del liutaio tedesco Cristhian Lijsen che ha ottenuto una medaglia d’oro e una di bronzo nel settore delle copie di strumenti ad arco e dello svedese Stephan Lindholm che si è aggiudicato una medaglia d’oro e una d’argento nella sezione strumenti antichizzati. Ungheresi e francesi gli altri vincitori di medaglie. Di rilievo l’affermazione di alcuni liutai italiani in particolare per l’acustica (Marcello Bellei di Modena e Lorenzo Rossi di Milano nelle due sezioni). Il cremonese Marcello Villa si è affermato invece nel settore Concorso liutai professionisti (medaglia d’argento) e gli allievi della scuola di Liuteria di Cremona hanno ottenuto notevoli affermazioni nel settore Concorso giovani liutai. Da rilevare l’affermazione di maestri liutai di varie parti d’Italia Modena, Asti, Ariano Irpino, Verona nel Concorso Liutai non professionisti. 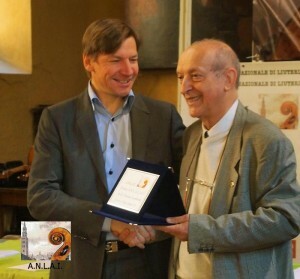 Il presidente dell’Anlai Prof. Gualtiero Nicolini nell’esprimere nella cerimonia di premiazione e di consegna dei diplomi e delle medaglie nella splendida cornice di Santa Maria della neve, il proprio compiacimento ha dato appuntamento a tutti alla prossima edizione della prestigiosa manifestazione per il maggio del prossimo anno. Il CDN dell'ANLAI, il Sindaco e l'assessore alla Cultura del Comune di Pisogne desiderano esprimere il più sentito ringraziamento ai presidenti e a tutti i membri della Giuria internazionale per il loro impegno, la competenza dimostrata, la correttezza e la disponibilità e in particolare ai maestri Cristiano Rossi e Florian Leonhard. Il Presidente della Giuria del 3° Concorso Internazionale di Liuteria di Pisogne (Strumenti Antichizzati e Copie di Strumenti Antichi) - Cristiano Rossi - discende da una famiglia di artisti bolognesi, ed inizia precocissimo, a nemmeno cinque anni, lo studio del Violino con una tale convinzione che lo porta a diplomarsi, a soli 16 anni, al Conservatorio di Bologna alla Scuola di Sandro Materassi. Intraprende subito l'attività concertistica vincendo importanti concorsi nazionali e internazionali, come Vittorio Veneto e Monaco di Baviera. A 18 anni, nel 1965, incide i suoi primi due dischi per la Erato di Parigi, attività discografica proseguita poi per la Emi, Dynamic e Naxos con numerosi CD dedicati a differenti periodi storici, da Vivaldi a Busoni, da Campagnoli a Wolf-Ferrari. Cristiano Rossi ha al suo attivo innumerevoli recital ed importanti concerti in tutte le città italiane, in Europa, Sud America, Stati Uniti e Giappone, per i Teatri più prestigiosi come Barbican Centre di Londra, Bunka Kaykan di Tokyo, Sala Tchaikovsky di Mosca, Filarmonica di S. Pietroburgo, Teatro Colon di Buenos Aires, Tonhalle di Zurigo. Ha partecipato ai Festival lnternazionali di Venezia, Stresa, Spoleto, Varna, Istanbul, Dubrovnik, suonando con famosi direttori quali Ahronovitch, Chailly, Oren, Pesko, Renzetti, Soudant, Delman. È stato invitato a partecipare a numerose e importanti manifestazioni: per l'Unicef, per il Bicentenario degli Stati Uniti (1976) con un recital alla Casa Bianca, per le Celebrazioni Colombiane (1992) a Genova, suonando il famoso "Cannone" di Paganini, a Castelgandolfo alla presenza di S.S. Papa Giovanni Paolo II, in Piazza Maggiore a Bologna nel 1995 e 1997 per i Concerti commemorativi del 2 Agosto, ed ha ricevuto vari prestigiosi Premi fra i quali il "Diapason d'Oro" della Rai. Numerose sono le sue registrazioni di concerti pubblici radiotelevisivi per la RAI, BBC, RSI, DRF ecc. Docente di Violino al Conservatorio “L. Cherubini” di Firenze per oltre vent'anni, attualmente si dedica a Corsi di Perfezionamento per giovani concertisti, invitato da prestigiose Accademie Musicali quali l'Accademia Pianistica di Imola, Asteria di Milano, Tadini di Lovere, Accademia Musicale di Firenze, ecc. Musicisti in giuria Cristiano Rossi (presidente), m° Marco Traverso, m° Ninni Saladino, m° Sebastiano M. Vianello. Liutai in giuria Florian Leonhard (England), Vettori Carlo (Firenze), Maurizio Tadioli (Cortetano), Philippe Girardine (Neuchatel Suisse), Massimo Negroni (IPIALL Cremona), Elisabetta Giordano (Cremona). Marco Traverso, nasce a Napoli inizia giovanissimo gli studi Musicali, diplomandosi in Viola e Violino sotto la guida del m° G. Cappone (I Viola Berliner). Ha suonato nelle più importanti Orchestre Italiane ed in varie formazioni cameristiche in Italia e all’estero. Si dedica alla ricerca di nuove Composizioni per Viola dal 2005 incide e si esibisce in duo con il m° B. Canino. E' stato Uto Ughi il presidente di giuria del 2° Concorso Internazionale di Liuteria di Pisogneper Strumenti Antichizzati e Copie d’Autore, la manifestazione organizzata dall’ ANLAI – Associazione Nazionale Liuteria Italiana. Gli eventi sono stati tenuti a Pisogne e nel circondario sino ad Artogne e Boario Terme dall’11 al 27 Settembre 2011. Le numerose iscrizioni, oltre 100, sono pervenute da paesi di tutto il mondo e testimoniano il crescente successo che sta vivendo la manifestazione. La Giuria, composta da liutai e musicisti di grande fama e notorietà: il cinese Zhen Quan il più famoso liutaio della Cina del Conservatorio di Pechino, il bulgaro Edrio Edrev Presidente dell’associazione regionale liutai bulgari di Kazanlak, il francese Bruno Montagne i liutai italiani Carlo Vettori di Firenze, Roberto Collini di Crema, Elisabetta Giordano di Cremona ed il maestro Tiziano Rizzi liutaio della Scuola civica di Milano. I musicisti invece il violinista Alessandro Cervo e il violoncellista Giacomo Grandi del quintetto Bottesini, il violinista Sebastiano Maria Vianello del Gruppo Notte Sinfonica Veneziana e Notte Veneziana, il violinista cinese Lin Zhaoyang del Conservatorio di Pechino ed il violinista Giulio Franzetti già primo violino della Scala. Grande soddisfazione è stata espressa dal presidente del ANLAI prof. Gualtiero Nicolini e dai membri del CDN. Oltre al concorso, con relativa mostra degli strumenti ammessi e premiati, con una serie di concerti e di mostre di carattere sia musicale che liutario. Nel concorso nazionale affermazione degli allievi e diplomati della Scuola Internazionale di Liuteria di Cremona anche della scuola emiliana. Consegnati Premi Anlai a personalità della liuteria della musica e del sociale. Nella chiesa di santa Maria della neve del Romanino di Pisogne si è svolta la cerimonia di premiazione dei liutai vincitori del 5° Concorso nazionale di Liuteria per strumenti ad arco presieduto dal m° Roby Lakatos e del 2° Concorso internazionale di Liuteria presieduto daUto Ughi e si è aperta la mostra delle opere ammesse. Al Concorso internazionale per strumenti antichizzati e copie di strumenti antichi erano iscritti liutai di 30 nazioni (Albania, Argentina, Armenia, Austria, Belgio, Bulgaria, Cina, Colombia, Corea del Sud, Francia, Germania, Giappone, Gran Bretagna, Grecia, Italia, Messico, Norvegia, Nuova Zelanda, Olanda, Polonia, Romania, Russia, Slovacchia, Slovenia, Spagna, Stati Uniti, Svezia, Svizzera, Ungheria, Uruguay). La giuria composta da liutai e musicisti di livello internazionale dai maestri liutai Bruno Montagne, Zheng Quan, Carlo Vettori, Roberto Collini, e Elisabetta Giordano e dai maestri Alessandro Cervo, Giacomo Grandi, Sebastiano Maria Vianello e Lin Zhaoyang, ha assegnato le medaglie d’oro allo svizzero Sylvain Rusticoni, al varesino Mattia Riva e al cremonese Sergio Maggi rispettivamente per gli strumenti antichizzati, per le copie d’autore di strumenti ad arco e per le copie di strumenti a pizzico. Le medaglie d’argento sono state assegnate a Marcello Villa e Valerio Ferron di Cremona e a Franco Merlo di Bovolone (Verona) e quelle di bronzo al perugino Filippo Protani, all’ungherese Rac’z Pal e allo sloveno Demsar. Sono stati quindi assegnati premi speciali al bulgaro Stoiko Chobanov, al coreano Oh Dong Hyun, a Dino Graziani di Orvieto e a Matteo Crotti di Carpi (Modena). Per il concorso nazionale tra i professionisti Marcello Villa (medaglia d’oro) ha preceduto l’altro cremonese Alessandro Gambarin e Marcello Bellei di Modena a sua volta vincitore nella sezione violoncello e a cui è stato attribuito anche un altro importante riconoscimento per la sua viola (Premio liutai bulgari). Nei violoncelli sezione professionisti al secondo posto il cinese Xue Yi e al terzo il bulgaro Slavo Rusi. Nel concorso libero tre coreani si sono piazzati al primi tre posti della graduatoria nella sezione violini Seo Seun Deok, Park Ji Hwan e Lee Seung Ji mentre per le viole la medaglia d’oro è stata attribuita al cinese Xue Yi che ha preceduto e Marco Brunelli di Pavia e Ignazio Muliello di Palermo. Per i violoncelli vittoria di Matteo Crotti di Carpi davanti al giapponese Shotaro Nishimmura e al cinesze Liu Zhaoyang. Nella sezione viola ancora medaglia d’oro a Valerio Ferron davanti Malina Politi e al giapponese Key Kaneko. Infine per il violoncello vittoria di Bonnet –Stelzer davanti a Key Yakubo. Particolarmente significativa la consegna dei Premi ANLAI 2011 al m° liutaio cinese Zheng Quan, al m° Pierangelo Balzarini premio alla memoria, ritirato con grande commozione dalla madre, alla dott.ssa Ornella Bellezza direttrice della Casa circondariale di Cremona (è stato suonato lo strumento Guarneri del Gesù costruito nel carcere di Cremona), al giornalista Mario Silla, al m° Matteo Fedeli, testimonial Aism, “ l’uomo degli Stradivari” , all’assessore alla Cultura del Comune di Pisogne Marina Berlinghieri e alla dott.ssa Alfia Milazzo presidente della Fondazione “ La città invisibile “ di Biancavilla ( Catania ) creatrice di orchestre di giovani secondo il metodo Abreu. Gli altri premi Anlai assegnati al cav. Giovanni Arvedi e ad Antonio Bergonzi saranno consegnati a Cremona in una cerimonia che si sta organizzando quello del presidente della Fondazione Risorgimento Musicale Nella Anfuso sarà consegnato ad Artimino il 22 ottobre durante il convegno dei 150 anni dell’Unità dell’Italia presente il presidente della Repubblica ed infine quello assegnato al presidente della Ibla Foundation Salvatore Moltisanti a Ragusa. Le manifestazioni a corollario del Concorso si svolgeranno sino al 2 ottobre a Pisogne, Boario terme, Artogne e Esine. In particolare “l’uomo degli Stradivari” terrà un concerto sabato prossimo nella Chiesa di Santa Maria Assunta con un violino Stradivari del 1726 mentre il giorno successivo e lunedì’ la soprano polacca Dominika Zamora si esibirà in un concerto di musica sacra nelle chiese parrocchiali di Esine e di Pisogne. Le manifestazioni si concluderanno ad Artogne il 2 ottobre p.v. con una conferenza di Cesare Gualazzini sulla costruzione della chitarra classica e con un concerto del m° Lucini. Una conferenza sulla costruzione della chitarra classica ha visto protagonista Cesare Gualazzini come già lo scorso anno ad Artogne, in provincia di Brescia, sabato 29 giugno in Valcamonica . L’iniziativa, dal titolo ‘l Legno di fa musica’, patrocinata dall’Anlai e organizzata in collaborazione con l'assessorato alla Cultura di Esine nella manifestazione " Sulle orme del Da Cemmo " , ha visto l’esposizione di alcune chitarre pregiate costruite dal Cesare Gualazzini una sua conferenza (“La costruzione della chitarra classica”), con interventi esecutivi e un concerto del Maestro Luca Lucini. Grazie all’ANLAI e al suo Presidente prof. Gualtiero Nicolini, presso la Casa circondariale di Cremona è stato istituito un corso di liuteria, affidato al liutaio Luca Bastiani. Sotto la sua guida un gruppo di detenuti sta in questi giorni realizzando una copia del violino Guarneri del Gesù “Stauffer”, uno dei capolavori della collezione del Comune di Cremona. Bastiani si è dichiarato felicissimo dell’impegno con il quale i detenuti seguono le lezioni. Spera che l’esperienza possa proseguire negli anni futuri ed è certo che il corso si concluderà già quest’anno con la presentazione del manufatto artistico finito e anche con un breve concerto. Memori della storia della liuteria e dell’alone di leggenda che coinvolge la vita e l’arte del liutaio “maledetto“ di Cremona, che avrebbe costruito parte della sua superba opera in carcere, si è voluto proprio scegliere un modello di Guarneri del Gesù anche per dare un maggior significato al corso e stimolare maggiormente gli allievi coinvolti. L’Anlai non è nuova all’organizzazione di corsi tesi a divulgare l’amore per la liuteria e l’arte liutaria italiana; lo scorso anno aveva presentato a Pisogne il corso divulgativo “ Come nasce un violino” sotto la direzione di Valery Prilipko. La stessa associazione ha proposto altri corsi da svolgere in futuro all’interno del carcere, per insegnare ai detenuti come costruire una chitarra classica oltre a strumenti e oggetti per la musicoterapia. Sono scaduti in questi giorni i termini per le iscrizioni ai concorsi di Pisogne organizzati dall’ANLAI in programma dal 17 al 28 settembre p.v. La Giuria internazionale presieduta dal grande maestro Uto Ughi e composta da noti musicisti e maestri liutai provenienti da Cina, Romania, Francia, Bulgaria e ovviamente Italia si riunirà a Darfo Boario terme dal 12 settembre per esaminare gli strumenti in concorso. La Giuria risulta così composta Presidente Uto Ughi m° liutai Carlo Vettori Firenze, Zhen Quan Pechino, Bruno Montagne Parigi, Roberto Collini Crema, Edrio Edrew Kazanlak, Elisabetta Giordano Cremona, Tiziano Rizzi Milano e dai musicisti maestri Ruby Lakatos, Giulio Franzetti, Alberto Cervo, Giacomo Grandi, Sebastiano Maria Vianello. Le opere ( strumenti antichizzati o copie di strumenti antichi per il concorso internazionale e strumenti classici ad arco moderni violini, viole e violoncelli per i concorsi nazionali per professionisti, non professionisti e giovani liutai ) dovranno essere consegnate o fatte pervenire tra il 9 e l’11 settembre a Cremona presso la sede ANLAI o direttamente a Pisogne nella Chiesa di Santa Maria della neve del Romanino. Il 17 settembre 2011 alle ore 15,00 presso la sala De Lisi di Pisogne si terrà la prova acustica aperta al pubblico e subito dopo la Giuria si riunirà per stilare la graduatorie finali ed annunciare i vincitori. Risultano iscritti al Concorso 170 liutai provenienti da 26 nazioni Argentina, Armenia, Austria, Belgio, Bulgaria, Cina, Colombia, Corea del Sud, Francia, Germania, Giappone, Gran Bretagna, Italia, Messico, Romania, Norvegia, Polonia, Russia, Slovenia, Spagna, Stati Uniti, Svezia, Svizzera, Ungheria , Belgio, Uruguay, Grecia e Nuova Zelanda. Il violino di Matteo Fedeli è stato costruito nella bottega di Antonio Stradivari nel 1726. Lo strumento presenta il fondo in due pezzi di acero con una vena dorata che dona lucentezza e profondità alla marezzatura. Le dimensioni dello strumento sono generose tanto da inserire questo esemplare in una stretta cerchia di cinque/sei violini denominati “Grand Stradivarius” e prodotti probabilmente su commissione per alcuni artisti la cui esigenza era quella di ricercare un suono ancora più ampio, dolce e potente rispetto agli esemplari costruiti sulla forma tradizionale. Le bombature della tavola e del fondo sono evidenti e piene così come importante è l’altezza delle fasce. Lo strumento è stato costruito un anno dopo rispetto al celebre “Da Vinci” con il quale condivide la bellezza dei legni. Interventi di restauro hanno riguardato principalmente la tavola e il fondo del violino ma fortunatamente non hanno influito sulle peculiarità sonore e timbriche del violino. La vernice, ancora presente in buona quantità, è gold-orange-brown. L’etichetta è originale. Negli anni lo strumento è stato certificato da prestigiose e rinomate famiglie di liutai tra cui Hill & Sons e Lyon & Healy. In accordo con Gio Ludovico Baglioni, fotografo di grande esperienza ed ingegno, l’ANLAI intende promuovere le botteghe di liutai di grandi capacità e correttezza e la loro opera in un nuovo progetto di notevole interesse e respiro, affascinante e di prossima realizzazione via internet.